The table below sets out the monthly record and payment dates for shareholders of record. The Company plans to expand its dividend throughout the year targeting a payout ratio up to 50% of its operating cash flow after taxes and general and administrative expenses. The dividend should provide shareholders with a link to gold and silver prices through the performance of the Company&apos;s royalties and streams. All dividends in the above table are &apos;Eligible Dividends&apos; pursuant to the Income Tax Act of Canada. Often, but not always, forward-looking statements can be identified by the use of words such as "plans", "expects", "is expected", "budgets", "scheduled", "estimates", "forecasts", "predicts", "projects", "intends", "targets", "aims", "anticipates" or "believes" or variations (including negative variations) of such words and phrases or may be identified by statements to the effect that certain actions "may", "could", "should", "would", "might" or "will" be taken, occur or be achieved. 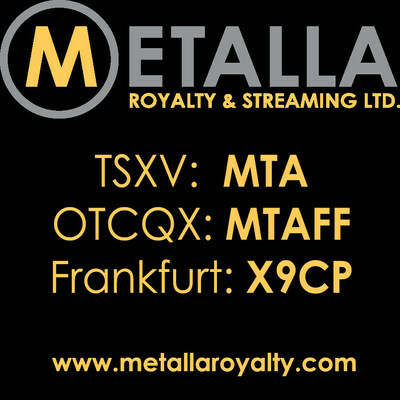 Forward-looking information in this press release includes, but is not limited to, statements with respect to future events or future performance of Metalla, future payments or increase of dividends, the adoption of the DRIP, the performance of the Metalla&apos;s royalties and streams disclosure regarding the precious metal purchase agreements and royalty payments to be paid to Metalla by property owners or operators of mining projects pursuant to net smelter returns and other royalty agreements of Metalla, continued ramp-up at the Endeavor Mine, management&apos;s expectations regarding Metalla&apos;s growth, results of operations, estimated future revenues, carrying value of assets, future dividends, and requirements for additional capital, production estimates, production costs and revenue, future demand for and prices of commodities, expected mining sequences, business prospects, and opportunities. Such forward-looking statements reflect management&apos;s current beliefs and are based on information currently available to management. Forward-looking statements involve known and unknown risks, uncertainties and other factors, which may cause the actual results, performance or achievements of the Company to be materially different from any future results, performance, or achievements expressed or implied by the forward-looking statements. The forward-looking statements contained in this press release are based on reasonable assumptions that have been made by management as at the date of such information and is subject to unknown risks, uncertainties and other factors that may cause the actual actions, events or results to be materially different from those expressed or implied by such forward-looking information, including, without limitation: the impact of general business and economic conditions; the ongoing operation of the properties in which the Company holds a royalty, stream, or other production-based interest by the owners or operators of such properties in a manner consistent with past practice; absence of control over mining operations; the accuracy of public statements and disclosures made by the owners or operators of such underlying properties; no material adverse change in the market price of the commodities that underlie the asset portfolio; and other risks and uncertainties disclosed under the heading "Risk Factors" in the Management&apos;s Discussion and Analysis of the Company dated September 28, 2017 filed with the Canadian securities regulatory authorities on the SEDAR website at www.sedar.com.